Black pepper is a common pantry item these days; it might be hard to believe it was once so valuable that it was used as currency. We take it for granted, but the majority of savory recipes include some form of black pepper as an ingredient. Pepper is ranked the third most added ingredient to recipes, with water and salt leading. To get basic ground black pepper, one must begin with whole peppercorns, not as commonly used nowadays. Peppercorns are the seed berries of the Piper nigrum, piper being Latin for plant, and nigrum meaning black, vine, originating on the Malabar Coast of India. Peppercorns are not only the oldest used spice, but also the most widely used. Said to be found more than 4,000 years ago, peppercorns were cultivated as long ago as 1000 B.C. Pepper was considered very valuable that unscrupulous suppliers often mixed in mustard husks, juniper berries, and even floor sweepings and ground charcoal to stretch its value. In 1875, the British Sale of Food and Drugs Law imposed restrictions against the selling of adulterated pepper. Today, pepper, known as the King of Spices and the Master Spice, still accounts for one fourth of the world's spice trade. Tunisians lead in pepper consumption with half a pound per person per year, Americans consume about one quarter pound per year. Black pepper is also an effective deterrent to insects. A solution of one-half teaspoon freshly ground pepper to one quart of warm water sprayed on plants can be toxic to ants, potato bugs, silverfish, and even roaches and moths. A sprinkling of ground pepper will also deter insect paths in non-garden areas. 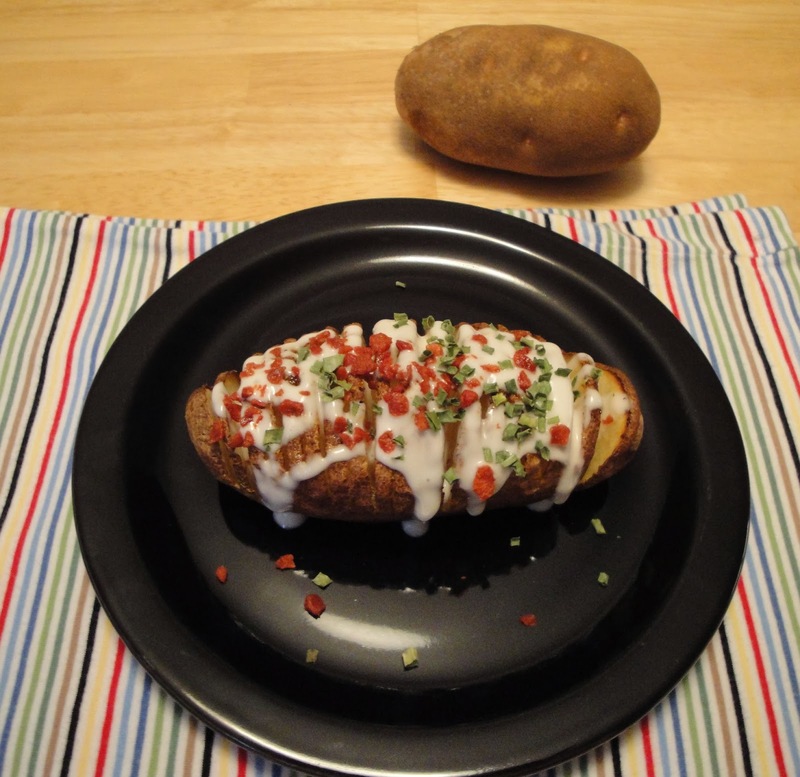 This baked potato is not your average baked potato. This looks like a very fancy side dish, but is actually very easy to do. As it bakes, the slices fan out slightly for a show stopping presentation. A unique and tasty way to serve potatoes. Lightly spray sheet pan with nonstick cooking spray. Slice each potato 1/8 inch thin, but don’t cut through the potato. Place potatoes on sheet pan. Between the cuts of the potatoes, add butter, seasoned salt, black pepper and garlic powder. Roast in oven about 1 hour, until tender in middle of potatoes and crispy on top. Top with ranch dressing, real bacon bits and chives. Enjoy!